Click the Windows Start button. In Windows Vista, type Event Viewer in the Start Search field. 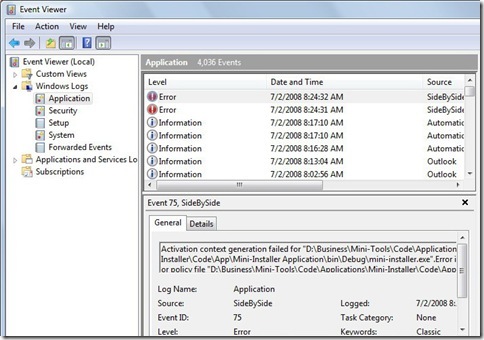 In Windows XP, click All Programs, click Administrative Tools, and then click Event Viewer. The Event Viewer window appears. In the tree pane on the left, double-click Windows Logs, then click Application to see the list of application events. I am trying to open the windows vista event viewer, in order to open my avast antivirus registration form. However, the virus on my laptop is not even letting me open the application log to fix the file that avast is located in. What steps should i follow to fix this problem? I am trying to play videos that I just uploaded from my new Kodak EasyShare Z981 camera. The response I get is ……”the application has failed to start because its side-by-side configuation is incorrect. Please see the application event log for more details.” I do not know where to find the “application event log.” If you can help, please advise. I have Windows Vista. Every time I try to open Outlook 2010 I get this error. 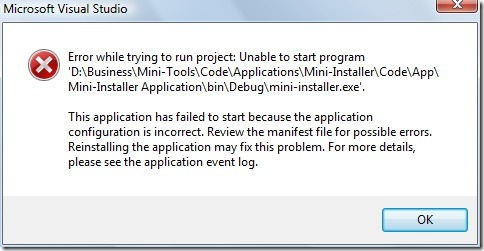 The application has failed to start because its side-to-side configuration is incorrect. Please see the application event log for more detail. hihi i tried opening windows live messenger but it stated that the side by side configuration is incorrect.Please see the application event log for more detail. hihi i tried opening windows live messenger but it stated that the side by side configuration is incorrect.Please see the application event log for more detail..
Everytime I open any Microsoft Office 2010 Professional program I get the following message: The application has failed to start because its side-to-side configuration is incorrect. Please see the application event log for more detail. I have been told to uninstall Office 2010 and reinstall but I do not want to lose my calendar and contacts in Outlook. Is there any way to fix this without a reinstall?